The EAC’s Food Connections summer intern, Alison Froese-Stoddard, tells her story of learning about soil while trying to grow the perfect tomato. I’m a rather lazy gardener, always looking for short cuts and a cheaper way of doing things. As with many things, I have to learn the hard way not to cut corners when it comes to the soil mix in my container garden. This is my somewhat embarrassing story of learning about soil the hard way. My poor soil actually made an appearance in this blog last summer. It was our first growing season in Nova Scotia, and I was excited to fill up our large raised bed garden. I did very little to the garden soil before planting, apart from mixing in a bit of commercial compost, because I figured that the earthworm rich soil should have lots of nutrients. The tomatoes on the left grew in the EAC’s office garden from plants I had started. 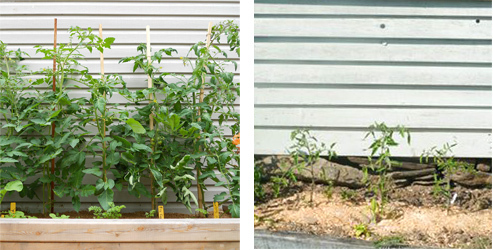 The tomatoes on the right are the same variety of plants in exhausted soil in my own garden. Not nearly enough, apparently. Combined with very poor spring weather, my tomato crop was incredibly pathetic, and apart from two plants in my front yard planted in better soil, my harvest was almost nil. This year, I did end up purchasing a few cubic yards of compost enriched garden soil, and topped up my garden considerably, along with adding nitrogen heavy bloodmeal , extra compost (homemade this time! ), kelp meal, and potassium rich greensand. At the end of June, many of my plants are already larger than they were at the end of August last year! Lesson learned! However, I’m still learning about potting soil the hard way. Last year I ended up buying a lot of commercial potting soil for my various containers of tomatoes, potatoes and other things. At the end of the summer, I put it in a big Rubbermaid container to get it out of the way. This spring, I pondered what should become of my old soil mix. 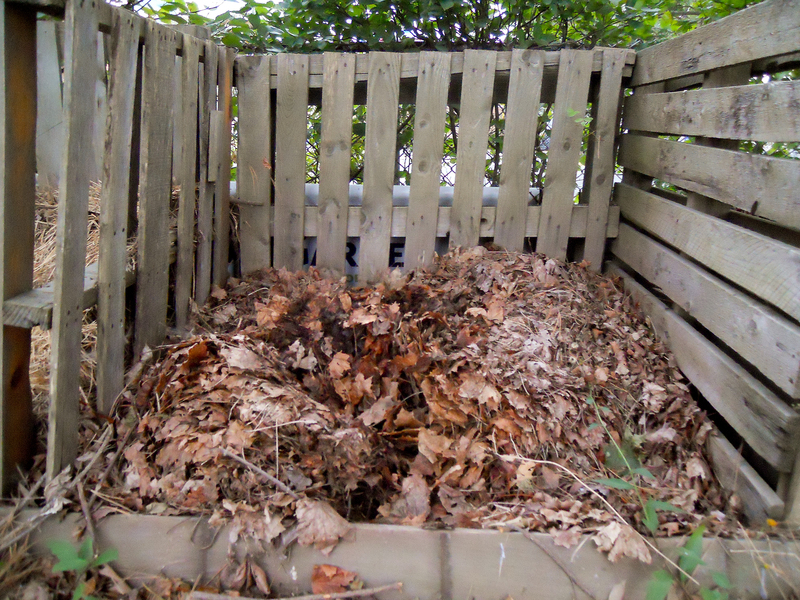 I checked online, and there seemed to be quite a bit of debate as to how one should proceed in this situation, with some pragmatic folks saying it’s fine to reuse as long as you add a bit of compost, and other people swore against reusing it and suggested throwing it in the compost to bulk it up. I did end up re-using it, and figured that if I added a few handfuls of compost to each container when I was potting up my plants, it should do the trick. After a month or so, it was obvious which containers had gotten fewer handfuls of compost – some of my plants had barely grown at all! I decided to re-pot the most pathetic of my container plants with extra compost, bloodmeal and greensand. This time, I mixed my old potting soil with lots of compost, and added my amendments at the suggested rate, and once it was all mixed well, I repotted the plants. It took a few weeks for my plants to recover from the transplant shock, but in the end I’m really glad I did it. 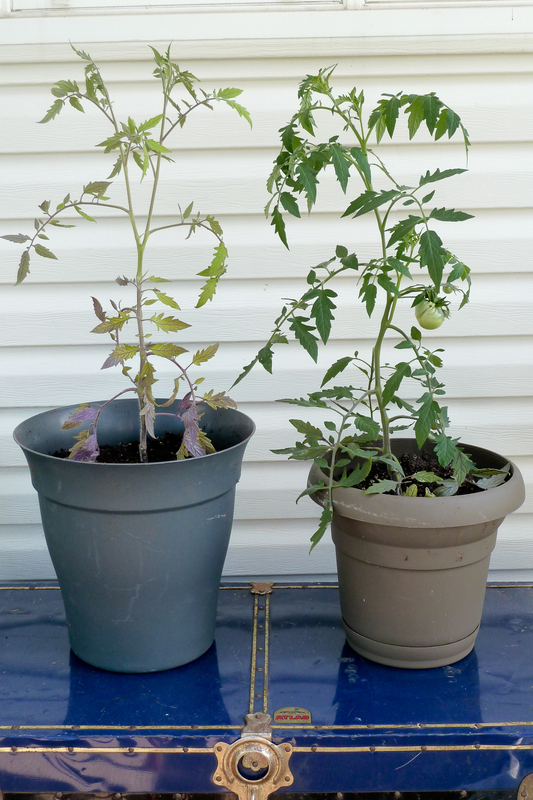 The above picture shows two of my tomato plants – the one on the left was the plant that originally was thriving due to the extra compost in the mix. The plant on the right was the repotted transplant with the extra compost, bloodmeal and greensand. What a difference! After I took this photo, I made sure I top dressed the spindly plant with more nutrients as well, and I’ll periodically add some seaweed fertilizer to my watering schedule throughout the summer. I did realize a bit too late that I should have used a larger pot when I moved it the second time, because the small pot will ultimately stunt its potential growth. However with some luck, these plants – along with the others in my garden – will grow enough tomatoes to put away for winter! Dr. Av Singh’s talk on soil health started with his desire to be practical, to explain soil health in a way that lets us go to our gardens and farms and make use of his ideas and suggestions. He focused on the need to observe one’s own land and soil, to speak with other farmers or gardeners and learn from each other, and to develop an intuitive sense about good and bad practice. 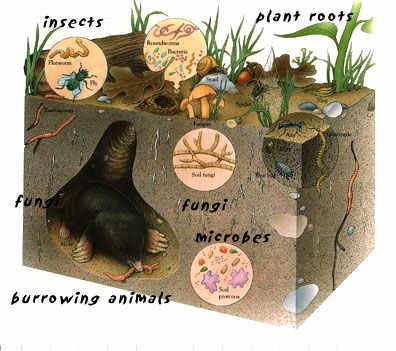 He began by speaking of the ‘Circle of Death’ created by inattentive or bad practice, then described the nature of soil, the soil food web, what makes healthy soil, and several ways to assess and remedy problems. The “Circle of Death” begins with poor, compacted soil, which leads to disease, and therefore unhappy plants, the likely use of pesticides to counteract weeds, which in turn leads to reduced beneficial microbes and fungi in the soil, leading to provide more fertilizer, which might be spread by heavy machines and thus lead to even more poor, more compacted soil. Poor, unhealthy soil can be caused most easily by overuse of synthetic chemicals, but is unfortunately very easy to do using organic practices as well – rototilling too much or using heavy machinery will compact the soil regardless of whether you’re using compost or chemical fertilizers. Instead of this “Circle of Death,” we want to recognize that soil is alive, a “dynamic living system,” and should be treated as such. Often home gardeners have more humus in their soil than farmers can achieve. Even in renowned agricultural regions like the Annapolis Valley the soil is less than 4% organic material. Other parts of Nova Scotia have equally good soil (for example along the North Shore or in Queen’s County), but people have put less effort into developing the area. Ideally it should have between 4-6% organic material. Overall, the soil food web acts largely to make nutrients available. It also decomposes plant residues, builds soil structure, protects against pathogens, and feeds higher life forms. 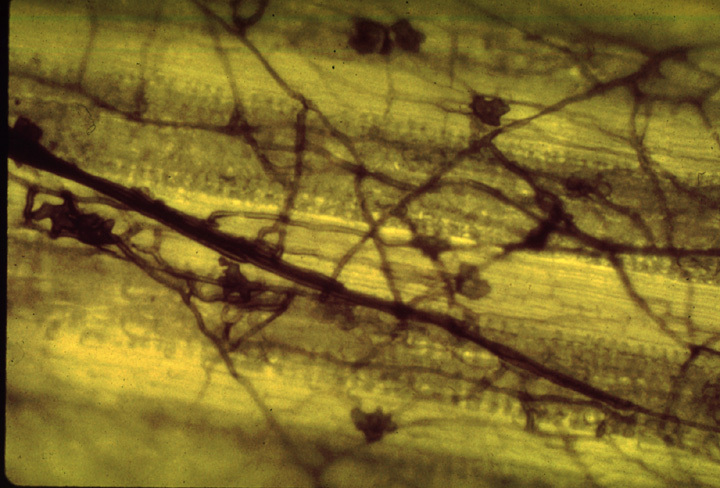 Dr. Singh showed a video taken of a root’s growth, showing the action of bacteria around the tip and around the root hairs. Part of it may be seen here. Most plants cannot use organic forms of nitrogen, for instance, and need inorganic forms. This is why synthetic fertilizers act so quickly. But naturally plants get access to these nutrients by the action of micro organisms. Even if you use synthetic fertilizers, it is very important to have a good soil food web, because that helps to make the right nutrients available in the right amount at the right time to the plants. Most plants can’t take in more than 10lbs of nitrogen in a week, so if there’s more than that – and that’s an amount healthy soil can easily make available – it just leaches out into the water system. 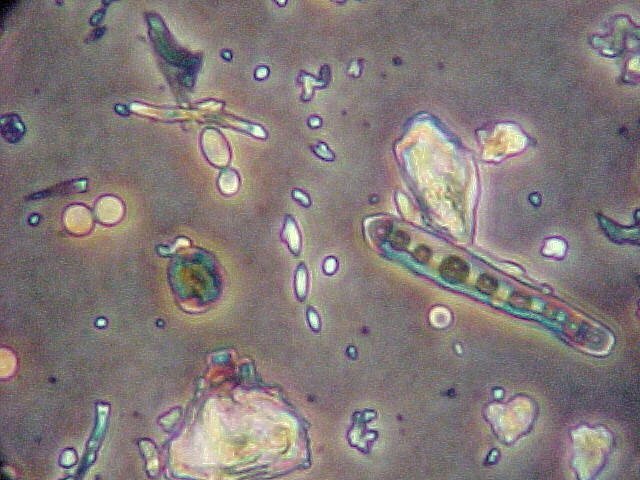 In healthy soil, there are billions of bacteria, say 5000 species in a teaspoonful. Not all the bacteria are active at any one time; some would be in spore form. There are kilometres’ worth of fungal hyphae, plus amoebae, protozoa, bacillia, etc. Both synthetic fertilizers, which are mostly salt, and tillage, desiccate the soil. Tillage destroys fungi, in particular, by breaking up their strands. No-till systems in a temperate climate like Nova Scotia’s make a predominantly fungal soil, which is ideal for a forest. Most crops, however, want a more bacterial soil, which requires more attention. Some plants, like maple trees, will send down the sweet sap in early spring in order to ‘wake up’ soil bacteria, who bloom and make nitrogen more available for the trees’ spring growth. You could use a very mild molasses (5%) solution to do the same thing. How Do You Assess Soil Health? 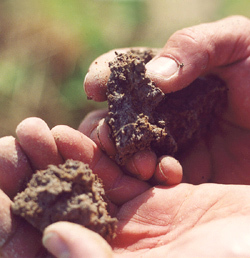 There are three main ways to assess soil health: biological, chemical, and physical analysis. The soil test (chemical analysis) provides a snapshot of what is “plant available,” using a variety of acid tests to measure soil acidity and the presence of various elements. This is good to do every few years. The pH or acidity level test is useful: most plants prefer slightly acidic soil (pH of 6 to 5.5) because the most nutrients are available then. Heavy metals become more available at lower pH levels, which is a concern particularly in urban gardening where there are more heavy metals in the environment. Urban gardeners should try to keep their soil pH above 6 if possible, using calacidic limestone, or even clean wood ash, put on a week or so before you plant. You can also use biological and physical analysis, by looking at plant indicators: the height of trees might indicate where the water table changes, or the homogeneity (or lack thereof) might suggest an abundance or lack of one element or another. Lots of yarrow, for instance, suggests the soil is low in potassium. By learning about these sorts of indicators, one can become less reliant on academic analysis. Earthworms have traditionally been used as an indicator of soil health. The more there are, generally the healthier the soil is. Their actions aerate the soil; worm casings come out as a neutral pH of 7.0, so they help maintain the balance of the soil. The important thing is to use your senses – all the physical senses and common sense! – especially smell. 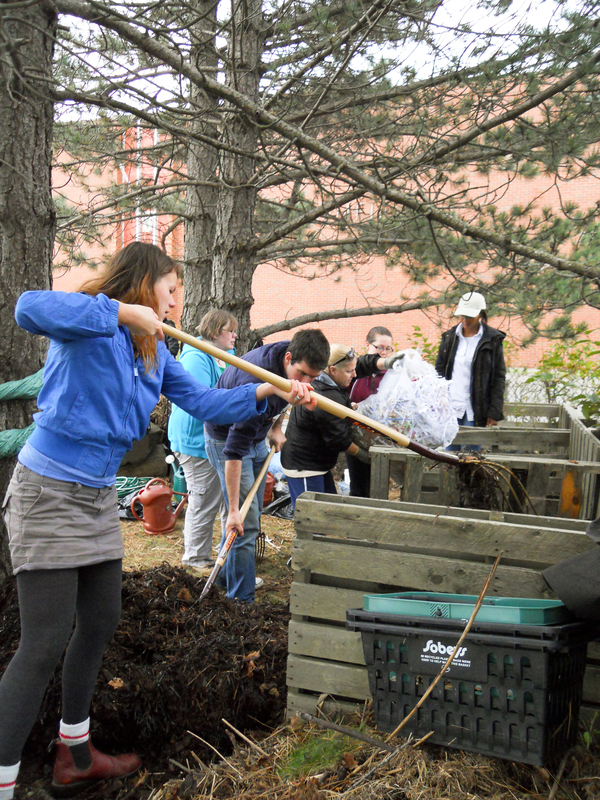 Good soil should have a nice earthy smell, which is the result of one particular microbe. 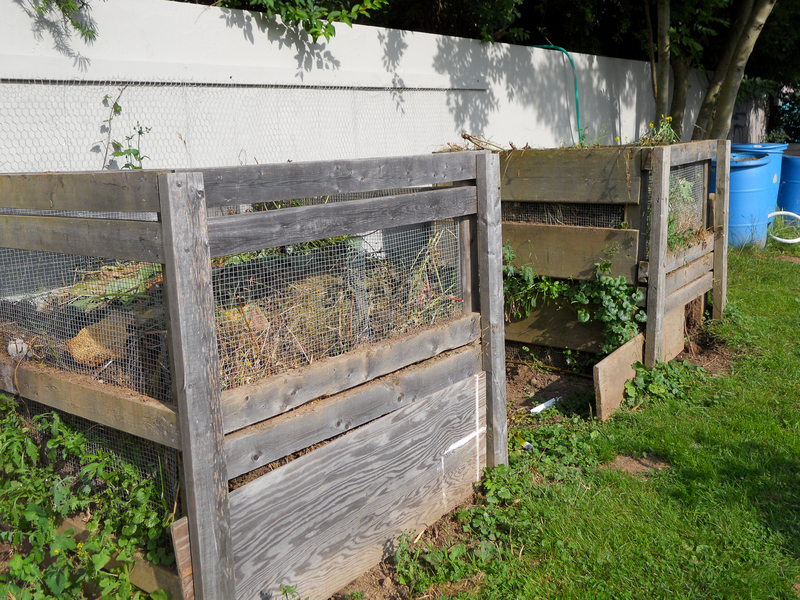 Bad smells generally show anaerobic conditions, which means a lack of air and bad growth for the plants. (Remember, the soul needs to be around 25% air.) Most plant diseases, especially root rots, are anaerobic. 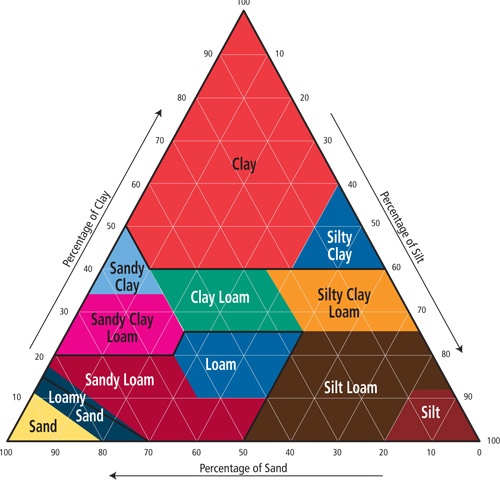 Soil is made up of sand, silt, and clay. It’s formed of aggregates, clumps of particles that are held together by electric chargers or glue-like substances exuded by bacteria. Good soil should have a texture that if you walked on it after heavy rain you wouldn’t sink more than 2 or 3 inches. Super-fine coffee-grind tilth doesn’t hold water properly, so except for seed beds you should avoid it. Dr. Singh recommended using the broad fork to break up the soil into clumps. This is enough to move it around, let roots penetrate easily, but doesn’t break it down too far. To find out the type of aggregates in your soil, put a cupful in water, stir it well, and let it settle down. If it settles quickly, it has good structure; if it stays in suspension (cloudy), it’s not so good and so should be amended. To build it up: add organic matter. Compost, cover crops or green manure, will help. Something like oil seed radish is good for backyard gardeners because it dies in the winter and can be dug under easily in the spring. To tell if soil is compacted, look at the roots of a plant. If it has a lot of lateral roots, especially ones with right-angle bends, or stunted roots, the soil is likely compacted. The plants wilt easily in a short period of drought because their roots don’t reach down far enough. You can also tell by using a tool called a penetrometer. You can also try digging a shovelful: a large clod should show signs of life, straight roots, earthworm holes (or worms), living white roots, and be easily broken up. Larger clumps would be at the bottom of the shovel, small, granola-sized particles at the top. If your soil is compacted, compost tea can be used to help boost microbial activity. Some other good things to look at are the soil colour: darker soil typically contains more organic matter, although of course it varies according to the underlying minerals and weathering at work. By digging a pit of a metre or so deep, you can see the topsoil, clay, subsoil, and also be used to check drainage after rain. You can also look at what happens to crop residue to assess nutrient cycling, the action of the soil food web. You don’t want surface matter to stay there year after year, but if it decomposes too quickly it might suggest that the soil is unbalanced. Although some plants like brassicas like nitrogen and would like that much activity! Overall, Dr. Singh emphasized the need to observe your soil. Knowing what your land is like – whether it’s in balance or needs extra compost, whether one part drains too fast or not at all – is what will let you be able to make it healthy and productive. We must remember that soil is alive and treat it accordingly.